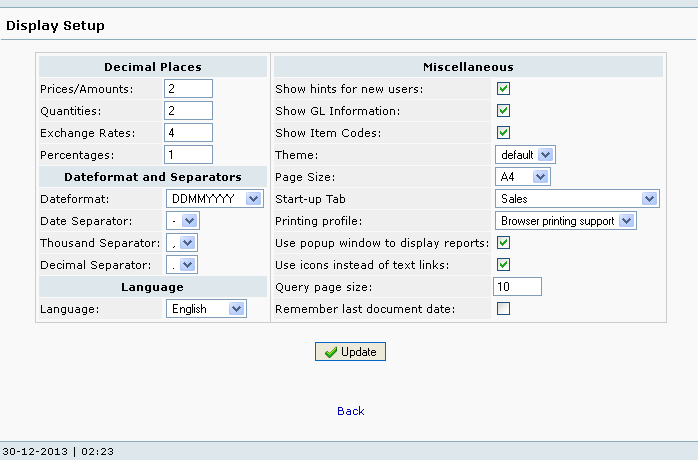 Set the default values for the language, figures, dates, printing and display. This menu can also be reached from the Preferences link in the header menu. Decimal Places - the number of decimal places to be displayed for Prices, Quantities, Exchange Rates, and Percentages. Date Format and Separators - the date format and the punctuation used for number and date separators. Ensure that your user preferences date format is same with your system date format to avoid unpredictable result returned by FrontAccounting server. Language - the default language to be displayed to users. Miscellaneous - various miscellaneous settings to be used by users. Query page size - Range from 1 to 127 since the field is a single (8 bit) byte signed integer. See Forum Post. If the date format is changed during a session, there will be some problem using the date picker. Logout, empty browser cache, close all browser instances and then login again.